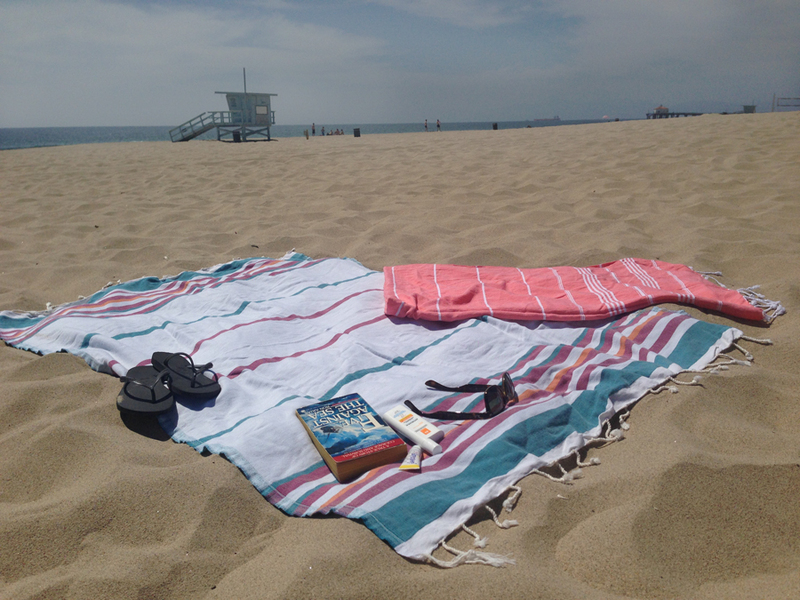 Let me introduce you to my new favorite summer accessory – the Turkish Towel. Specifically, the smart Turkish towel from California company, Turquoise Collection. I discovered them for the first time a few weeks ago while walking on the Strand in Hermosa Beach. I noticed a group of girls laying on the beach on top of about five different colorful blankets and learned that they weren’t using regular beach towels or blankets, instead they were using Turkish towels. One of the women proceeded to introduce me to the multipurpose power of the Turkish towel. She showed me how to use a towel as a skirt, a scarf, a dress, a head wrap and even a bag! She also told me that she brings her towel on picnics and even uses it around the house as a tablecloth and a blanket. Talk about a heavy lifting piece of fabric, this thing does it all! I tracked down the maker of these magic towels and learned that they’re actually based out of California. They invited me to their headquarters and I got to check out all of their beautiful fabrics. I was really enamored by both the company and their product. I especially love their Catalina style ($43.95) and the Venice Soft ($32.95). They may be based out of California, but these amazing towels are made by traditional methods in Turkey and sold all over the South Bay – as well as on their website. The best part? I’m giving two away this month as part of my summer essentials posts – courtesy of Turquoise Collection. Be sure to visit their website and check out all of their amazing patterns! They have almost every color and pattern imaginable, and the towels are amazingly soft. *Turquoise Collection has provided me with a sample of their eyewear for purposes of providing a review and offering a giveaway. I received the product at no charge. I could actually take this with me to Central Asia and Europe this summer! Can’t take too much stuff in my backpack, but this sounds like it could be useful 😀 Non-girly colors available? I would love to lay out in my backyard with a good book, my kitty cat, and one of these towels! Congratulations Sara!!! You won one of the Turkish towels. Please email strandstylefashion@gmail.com so I can send one to you! I plan on spending a lot of time at the beach this summer and this sure would come in handy!